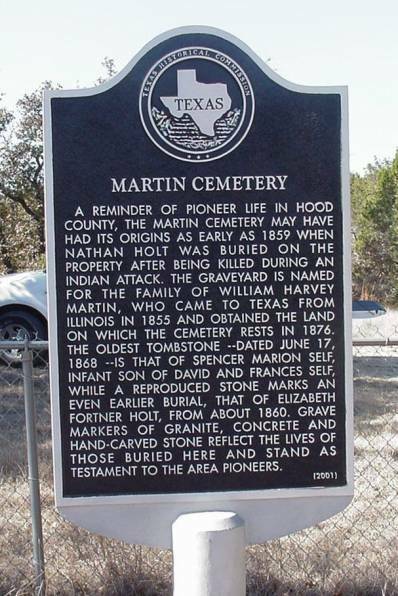 Martin Cemetery is located in Hood County, Texas, about 2½ miles to the south of FM Road 4 and about five miles east of Lipan, heading toward Granbury. William Harvey Martin acquired the land when he moved to Hood County in 1876. Historians say Martin served as a preacher, county commissioner and justice of the peace at Lipan. Although he didn’t own the land when the first people were interred there, when he did acquire it, Mr. Martin set aside an acre of land for the cemetery. The cemetery is the final resting place of at least three people killed by Indians in the Lipan area. It’s also rumored to hold the graves of seven Indians killed in Hood County’s last Indian fight near Lipan about 1872. Nathan Holt is believed to be the first man buried in the Martin Cemetery. He was killed by Indians in the summer of 1859 while trying to round up some of his cattle. Holt, who was pierced with a dozen arrows, was found two days later, say historians. There are many pioneer names buried there: Rozel, Gilliam, Miller, Millington, Makamson, Pilkington, Yancy, Self, Spencer, Langley, Thompson, Helm, Raifsnider, lots of Martins, and lots of Holts. And there are the Sparks, Nelsons, and many others who were part of the pioneers of Hood County in the 1800’s. After discussions with many of the Holt family, and passing the hat for donations to cover the expense, a triple marker for James Simpson Holt and first wife, Elizabeth Fortner Holt, and second wife, Lutitia Lucretia Self Holt, was set at their graves on September 13, 2000. Although my father’s father and grandfather, two brothers, a sister and many other of his relatives (including the aforementioned Nathan, who was the first buried in the cemetery), were buried in this cemetery, he was buried in Odessa, Texas. I thought it fitting that he should be buried here, too. After getting approval from all concerned, his remains were moved from Odessa and re-interred in Martin Cemetery in October 2001 next to his mother Ella Louise Crews Holt. I was introduced to the cemetery in 1954 after the death of my father in 1953. He never spoke of this place other than he was born near there, and his father was born in Springtown at a time when Indians were raiding the countryside. My wife and I attended some of the meetings of the Martin Cemetery Association, and in April 1979 I was elected President. In 2001, I was replaced by Alford Spencer. In those years we made a lot of improvements, the latest of which was getting an historical marker installed. This took nearly ten years. At the 1990 meeting at the cemetery, we had a visitor from Ft. Worth, Karl Komatsu, President of Tarrant County Historical Society. He informed us that the cemetery was subject to historical recognition. We would have to send an application to the State of Texas, along with a copy of a survey and list of graves, marked and unmarked. When I told Karl I wanted to get the cemetery surveyed since I could not find any record of one within the last 50 years, he said he would like to join us. So, in June 1991, with the help of my wife, my kids, grandkids and some others, we made the survey. Karl Komatsu came with his five-year-old son, Brice. A surveyor from Aledo brought his instruments, and with these we were able to complete the entire survey in one day. We went around the perimeter of the cemetery and the head of each grave, marked and unmarked (and there were a bunch unmarked), and recorded them in rows and numbers in about a three-hour period. I was prepared for this to take me, a couple of grandsons, and two 100-foot steel tapes tied together, two or three days. Later we had to update the numbering plat; and have given the Hood County Library, the Parker County Library, the Texas Historical Society, and the Hood County Historical Society copies of the updated plat. After we were able to get the cemetery recognized by the State as a designated cemetery, we made an application for the historical marker. In 1999 the project for obtaining the marker began with raising money. We needed between $800 and $1,000, and it started coming in. Dorothy Bolton became a receiver for the marker-fund money, and she kept us posted on the amount received. I think we made our goal in record time, receiving money from a wide variety of people in addition to those who had an interest in the cemetery, i.e. relatives or friends of those buried there. Karen Nace from the Hood County Historical Society researched the courthouse records to get the links needed from before the cemetery property became Martin Cemetery. The state needed information on who owned the land before Martin and who had the land that bordered the cemetery. A month or so earlier Lucy and I attended an historical marker dedication for The Colony Cemetery outside of Granbury. It was an all-black cemetery, but most of the descendents of the slaves and ex-slaves who had settled around there had already moved off. So the Hood County Historical Society obtained a marker, and the Highway Department had set it in a concrete form of Texas. It was kind of crude, but it gave me an idea. So I set up in our big garage and proceeded to make a Texas form. Wendell, my son, had given me several pieces of large, 4” styrofoam, and I stuck two pieces of this together and stood it up against the wall. I found the center and matched it to the center of a Texas map. Then I measured from the center of the map to a corner or some other spot; then I doubled it. Where I had a 30” measurement across the map from El Paso to Texarkana, the styrofoam form that I was cutting out was 60” giving us a 5’ stone with a 4” hole in the center for the marker to go into. I poured that, let it set for about a week, put it on my son-in-law’s (David Kubosh) pickup, and hauled it down to the cemetery. Alford and Bobby Spencer met me there with their Bobcat with an auger on it. We punched a hole in the ground where we were going to put the marker and then lifted that 4” thick concrete Texas up out of David’s pickup and set it in place, leveled it, and put the marker in it. In a little over an hour we were done and out of there. If we’d had to pour that thing down there at the cemetery, it would have taken all day. That particular day my sweet favorite wife, my lover, my buddy, my partner, Lucy, and I spent our 58th Wedding Anniversary at the cemetery setting that marker. David, Chris, and Carol were also there with us, and they were busy little bees digging out the shape of Texas in the ground. So we put out a sign on the east side and one past the Diamond A Ranch on the west side. We then went into the Diamond A Ranch and placed two signs at the fork in the road to let people know which way to go - the first one would go to the right, the next one would go to the left, through a pipe gate down to the cemetery. A lot of people appreciated this and said, “Thank goodness for the signs.” Although I removed them after the dedication, I have it rigged where I can just stick them back into pipes we planted in the ground. We had a wonderful turnout at the dedication. I was expecting probably 40 to 50 people, and Lucy said there might be as many as 60. We had advertised well in the two local newspapers, and the Granbury paper gave us five write-ups on the cemetery alone which certainly improved attendance. There were 171 who signed the register, and we know of at least four who did not sign. There were four members of the Sons of the American Revolution: James Alderman and Donald Pray from the Ft. Worth chapter, and Morin Blacklock and Charles Allerton from Granbury. They came in full American Revolution color-guard uniforms, and they drew quite a crowd of picture takers. Although we had records of six veterans from WWI and WWII buried in the cemetery, the day before we found some who had fought in the Civil War. In all, there were 13 veterans, and the American Legion out of Granbury placed small American flags in the ground near the stones of those 13 veterans. I was greatly impressed and appreciative of the SAR and American Legion Post participating to help us make this marker dedication a great success. Lucy had Certificates of Achievement ready for several people, including Dorothy Bolton, Karen Nace and her working partner, Dian Long, out of the Hood County Historical Society. Karl Komatsu was unable to attend. The next day when we counted the number of people who had signed the register, there were 175 people who showed up. Another year and more things are going on. In November of 2002 in a family gathering at the cemetery, Lena and Pat Holt commented about needing a flagpole, and that before Johnny Holt died he had said we need a flagpole for special occasions at the cemetery. 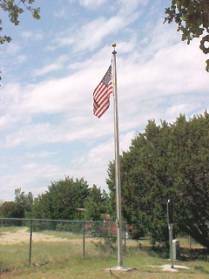 In December of 2002, I was offered a free flagpole to honor the veterans of the Martin Cemetery. It is a nice pole, about 23 ft. high and made of aluminum with a brass ball on top. The Weatherford Democrat newspaper was pleased to donate the flagpole for this purpose. On January 17, 2003, I met with Larry Byrd of B&L Pole Co. for removal of the pole from the Weatherford Democrat News office. We placed it on Keith Kubosh’s pickup with Carol Beaird driving and delivered it to my back yard. Then on February 22, Dale Holt took it to the cemetery. On March 4, Jack Holt, Carol Beaird, and Dave Rayburn tripped to Martin to set the base for the pole. Then on March 8th, the pole was set. Dale Holt made several trips from his home in Ector, Texas, and did most of the work with some help from Jack, Lucy, Wendell, Lena Holt, Evelyn Moore, and Carol Beaird. We now have a very nice pole to display our flag. On April 22, 2003, we set a marker in memory of Nathan Holt. He is thought to have been the first person buried in Martin Cemetery. It is placed to the right of the historical marker near the west fence.